Skiing posters, like many advertising posters, were originally produced to entice holiday-makers and winter thrill-seekers to resorts and alpine areas. The early- to mid-century skiing posters were often designed by notable artists of the time and are colourful, dynamic, glamorous, nostalgic and stylish, sometimes also fun and quirky. The ones that survived now make for a good investment, ideal for decorating chalets and "back home" as a stunning reminder of a memorable ski trip. Click here for more information on our exhibition featuring original vintage skiing and winter sports posters from around the world. The catalogue for our exhibition is available to purchase online and at our gallery: AntikBar, 404 King's Road, Chelsea, London SW10 0LJ. January 2016: AntikBar featured by Antique Collecting magazine (available by subscription and online). January 2015: AntikBar's original vintage skiing posters were featured by The Times (9/1/15) and Financial Times (10/1/15). Click here for more information and image links. The Antiques Trade Gazette reported another record-breaking result achieved at Christie's Ski Sale in 2016: a 1934 poster by the Swiss artist, Alex Walter Diggelmann, advertising Gstaad that sold for £62,000. This poster was described "as rare and desirable...with a strong design and featuring a top skiing destination." Katherine Higgens commented on Christie's 2012 Ski Sale in Homes and Antiques: "Conjuring snowy peaks and the glamour of apres ski, it's no wonder vintage ski posters are whooshing out of the salerooms... Launching into the ski poster market is easier than you might think. A good starting point is to focus on locations you have visited. After that, what you select is governed by how much you want to spend... Posters for popular resorts tend to be the most expensive." Below is a small selection of original vintage skiing posters available to purchase online from AntikBar with worldwide delivery. 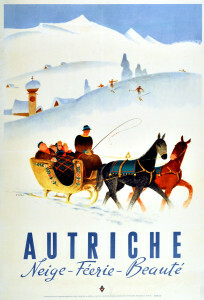 Visit www.antikbar.co.uk/products/ski_posters or use our search facility at the top of the page to browse all our skiing and winter sport posters. Please contact us if you have any specific requests or queries.